On May 4, 2011, the CUNY Adjunct Project hosted the event “‘What Do You Mean I Can’t Strike?’: Confronting the Taylor Law” (full video here) featuring the speakers Cindy Gorn, Ajamu Sankofa, Jeffrey Perry, and Marvin Holland, the facilitator Conor Tomás Reed, and a packed room of NYC rank-and-file militants. This final dialogue in a spring-2011 series occurred in the wake of the Arab Spring revolts and Wisconsin Capitol occupation, and before the May 12 “Day of Rage” Wall Street protests, June-July Bloombergville encampment, and September-November Occupy Wall Street transformation of Zuccotti Park. 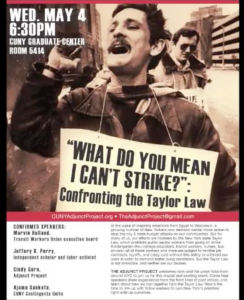 The speakers shared about union struggles that led to the Taylor Law’s creation; lessons from 1970s postal workers’ wildcat strikes; the links between job precarity and targeted political firings; and the 2005 NYC transit workers’ strike and aftermath of Taylor Law repression. 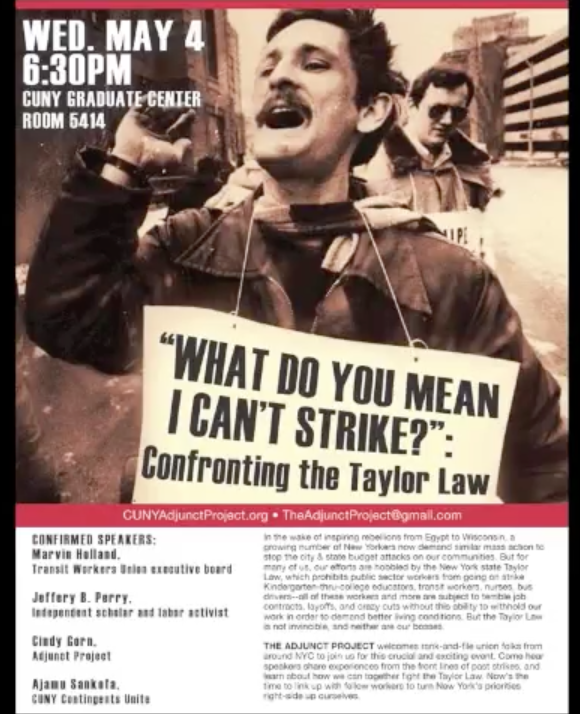 As the CUNY faculty and staff union the Professional Staff Congress (PSC) debates anew the possibility of a strike in connection with the current contract campaign, within a city reeling from both austerity and mass protests, this 2011 dialogue can inform potential dangers and radical breakthroughs ahead. Video recorded and edited by Jill Humphries, PhD. Event poster designed by Adriano Contreras. ← We Are Workers: Graduate Worker Day of Action—GC Edition!